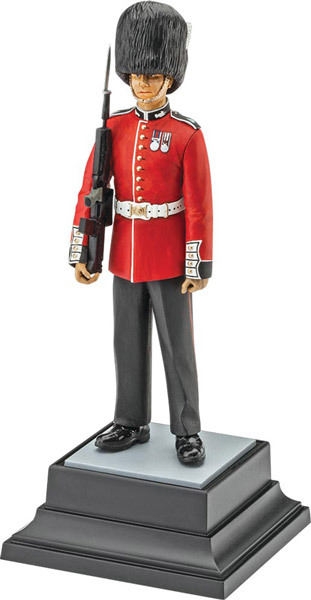 Contrary to the apparent beliefs of many tourists, the Queen's Guard are real soldiers with real duties, real automatic weapons, and real bearskin caps. Their duties and the manner and which those duties are executed were established over a hundred years before the United States gained independence. For them, guarding the Queen is a duty handed down through centuries and steeped in significance. For the rest of us tourists, it's a darn good photo opp. Kit features finely detailed face, uniforms, and insignia; rifle, bearskin cap, display stand with surface features, and authentic decals.